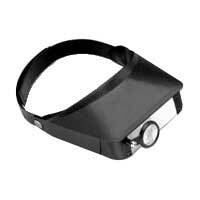 This economy head-mounted magnifier has 3 lenses: one binocular lens, a second binocular lens behind the first that flips up, and a pivoting loupe. Using different combinations of these lenses, 4 magnifications are possible: 1.8X, 2.3X, 3.7X, and 4.8X. Velcro-type head band.